Sicily is a treat for ancient history buffs. There are grand Greek and Roman sites as well as a bit of Phoenician remnants. The Neolithic settlements on Lipari in the Aeolian Islands are well documented in the city archeology museum. There are more 12th century Norman churches on Sicily than we've seen anywhere else. And it was in Sicily that we stumbled upon intact Albania communities that were founded in the late 1400's by Albanians fleeing Turkish invasions--communities whose current religion is visibly a blend of Catholic and Byzantine traditions. Geology fans will have their fun in Sicily too, especially with the volcanoes. Mt Etna is on the mainland and Stromboli and Vulcano are off the coast of Messina in the Aeolians. The 'from the saddle' scenery, especially in the interior, was often grand. We usually welcome historical sites to liven up our traveling, but the natural scenery in the Sicilian mountain area was enough stimulation, we didn't long for more to engage our minds. We loved them. We spent a week based at Lipari and did day trips to other islands as well as did some walking around Lipari. Hiking to the top of nearby Vulcano was well worth it. Making a day trip to Stromboli and doing the forced-march to the top at sunset with a group wasn't as good a return on the time or money spent. Stromboli from Lipari is a 12 hour day to spend about 20-30 minutes watching the volcano fizzle and spurt. Boots are required by the guide for the journey and can be rented from a Stromboli business for 6€, as can be other accessories. Bring your own flashlight or helmet light for a rapid, steep decent in the dark. Seeing the sulfur-emitting underwater fumaroles near Panarea on the way to Stromboli is cool however. This sign marks the trail head for the best trail on Salina. 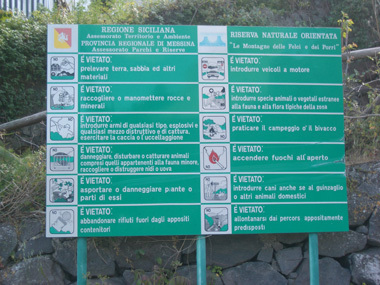 If you are on Salina island and looking for the great hiking trail, keeping looking until you find the green sign like the one shown here. We thrashed around in the bush with other tourists who were convinced they were on the right trail and we were all wrong. We then only had a short amount of time to explore this much better route. This trail will take you to a high point on the island before depositing you down on the other side. Mt Etna is a challenge to see. We biked around 3/4's of her base and found it to be 'ho-hum' rather than dazzling, both because of her broad shape and the persistent haze. You can make as similar excursion by a private train, either just for the view or to stop-over in the Etna district villages. Linguaglossa is the best access point to the northern hiking routes up the mountain; Nicolosi or Catania are the places to be for the southern routes. We spent the night in Linguaglossa but did not hike from there. Were we to do it again, we would have spent another night or 2 there to see what could be seen on hikes in that area. It's a more forested area than the south so we passed it by for the southern routes. We stayed in Nicolosi (700 m), which is about 20 km (12 miles) from Rifugio Sapienza or Nicolosi Nord at 1910 m, the launching point for Mt Etna activities on the south. Nicolosi is a pleasant village with lots of lodging and sufficient tourist services and a tourist office with limited hours and limited English skills. They do have an odd habit of keeping their lovely city parks locked shut, however. As is generally the case outside of the cities, having your own transportation makes everything easier on Mt Etna. As planned, we took the public AST bus up to the Rifugio--what we didn't know until the next day was that that was the ONLY bus. There is only 1 bus up the mountain in the morning, somewhere between 9-9:30 am from the park in front of Nicolosi's Municipio building and 1 bus down at 4:30, with the bus starting and finishing in Catania. The bus was 3.70€ per person, roundtrip. Our group was an hour late in getting off the mountain and so we had to bum a ride back to town at 5:30. Seeing Etna up close is pricy. There is much talk of 'obligatory guides for safety' though it isn't enforced. Their de facto enforcement is in not making maps available nor posting signs on the routes. We caved in and paid for a package deal. In 2008 the choices were roundtrip, per person in round numbers: 30€ to take the funivia (cable car) to the 2500 m point, 50€ to add a very rough 9 km Jeep-like ride to the 2920 m level, or 60€ to do all of that and get a guided walk up to the 3345 m level (on a good day) and over to Valle del Bove. We sprung for the 6-7 hour, 60€ deal and were satisfied with the value. The sun burnt and burnt-out guide was grumpy but our multi-lingual companions in our group of 20 that dwindled to 14 were delightful. It was cold and windy at the 2500 m level and we wore everything we had with us, including winter hats and medium weight gloves. After the funivia, there are no toilets, no trees, no-nothing even where the Jeeps mill about, so peeing is a very public affair. Hiking boots can be borrowed at no charge and jackets were available but our frazzled guide didn't offer them to any one in our group. Had we to do it over again, I'd budget a morning to bike (unloaded) to the Rifigio Sapienza just to take in the views. None of the views of Etna are grand, but one is compelled to keep trying. From the AST bus on the way up to the Rifugio we spotted a roof top--all that remained visible of house engulfed by a sea of lava from a recent flow. Parking for cars is limited on the route so being on a bike allows one to stop where the best views are to snap a photo. Allow at least 4 hours for the 40 km round trip bike trip at a recreational speed with lots of stops for photos (that included 45 minutes for the descent). The grades range from 4-12% with much time spent in the 5-8% range. Budget a little more time for exploring the immediate Rifugio area and perhaps shopping for an excursion the next day. There is also supposed to be a tourist office there but we didn't have time to track it down. If you timed it right, you could then top off your half day bike trip with a visit to Nicolosi's volcanology museum, which is open some afternoons and more mornings. That being said, making the bike trip in the afternoon avoids much of the tour bus traffic on the road. Take an ample supply of warm clothes for the descent and be prepared for rain. The "Museo dello Sbarco" near the cultural center on the waterfront wasn't mentioned in our Lonely Planet guide book but held our attention for several hours. There is essentially no English at the museum, but it's worth the time if you are interested in WWII history. Newly opened in 2002, its freshness shows in the well-done exhibits. Even being able to read a little Italian will enhance your experience. In 2008 it was closed Mondays and all afternoons except Tuesdays and Thursdays. We loved biking in Sicily and it rapidly became a favorite place for cyclotouring. Sicily has that winning combination of sufficient lodging; stunning scenery; lots of visual variety, and well presented history to make it a delight. Our least favorite areas were where we happened to be in the fall of 2007. Then we rode from Palermo to Tràpani, on to Marsala, then because of foul weather, hopped a train inland back to Palermo. We usually love coastal biking, but this area wasn't rewarding. It was that worn-out, over-used flatter coast line look that we don't enjoy. In the spring of 2008 we headed practically straight up to Erice from Tràpani and were in love. Erice was a hard climb for our deconditioned bodies but the stunning views and sense of history dished out the rewards. From there we meandered inland in an odd zig-zagging route that included Alcamo, Piana degli Albanesi, Corleone, and eventually came out on the northern coast at Cefalu. The western interior was a delight. Bill was using GPS for the first time, which gave him courage to go on even smaller roads. Some turned out to be unpaved and were very difficult going but those roads in turn delivered some of the most stunning scenery. We were doing more elevation gain per mile than when we are doing passes every day or 2 in the Dolomites but of course never got very high. The coastline east of Cefalu wasn't very interesting though it picked up around Cap d'Orlando as we headed east. Our generally west to east route meant that the sometimes strong, persistent winds were usually at our backs. We began in late March and left the island in mid-May and had overall good weather for that time of year. We did get pelted by snow, sleet, and hail during a thunder and lightning storm one afternoon that came on the heels of a lovely morning. Most of our accommodations had sufficient heat, which was necessary for this time of year. We continued on to Messina, Taormina, and on to do a 3/4's loop of Mt Etna. We lingered at Nicolosi to take a guided excursion up Etna. Palermo, Sicily: There are 3 hotels side by side or up and down from each other on Via Roma, a short walk from the train station. Hotel del Centro is in the guide books and seems to always be full or nearly full. Make reservations for the weekend well in advance, even in low season. The front desk folks during our stay were all quite conversant with their English. About 70€ for 2 with a substantial breakfast. Insist on not having room #33 if you are tall, inclined towards claustrophobia, are fussy about observing fire codes, or often pee in the night. Room #18 is cramped and often the last room available but is OK. Good sound proofing for the traffic noise, no soundproofing from hallway noise. No heat in our room #18 though we were told when we departed that there should have been. We didn't stay here with the bikes but noticed 1 guest bike stashed under the stairway within the hotel itself (vs the public stairs.) Via Roma, 72, 2nd piano (floor); Tel. 091 6170376; Fax: 091 6173654; www.hoteldelcentro.it info@hotelcentro.it. Hotel Concordia is in the same building at del Centro but on the 4th floor. About the same price as Centro. We didn't stay there but the room looked nice and the staff was pleasant. They may not speak much English. They may be more pressed for a place to store the bikes though we didn't ask as they were booked. Tel: 091 6230635; Fax: 091 6101248; hotelconcordia@virgilio.it; w www.concordiahotel.info. Hotel Italia is just a couple of doors down from the Centro and Concordia. It's not as nice as the Centro, lacks the sound proofing windows which are important in Palermo, and they don't serve breakfast. But it is clean, the hostess is eager to please, and rooms were available there when they weren't elsewhere. The hostess doesn't speak any English but doesn't let that slow her down. She was patient with our caveman Italian and I am sure manages just fine without out it. For 2, it's 55€ per night when things are slow, 65€ when its busier. She will allow bikes in your room. We paid her 10€ to hold a small suitcase for us for 3 weeks. Oh, and the second hand smoke is an issue. We used an old trick of lightly applying a strip of masking tape around the door to keep the smoke in the hall from filtering into our room. You control the heat; no English on the TV. Room #12 is one of her quieter rooms--less street noise and far from her entry way noise. Via Roma, 62; 90133 Palermo; Tel. 091 6230656; Cell: 338 9222547; Email: hotelitalia62@hotmail.com. Hotel Alessandra (sp?) on Via Maqueda is another option. They are remodeling and are very accommodating however, the room we were in suffered mightily from the street noise. Via Roma, the major one-way street going the opposite direction is just enough wider to make the traffic din more tolerable. The staff speaks English. Around 70€ per night for 2. Albergo Maccotta is a great little 2 star hotel in the heart of the old town for 55-65€ for 2 people per night. Clean, modern, fresh, and everything works. It has heat and air conditioning that the guest controls and great reception for TIM mobile phone-internet users. Keep fiddling with the TV remote button "guida tv" and you'll find BBC. After peeking in other vacated rooms, it appears that our #105 was one of the bigger rooms with a better "view" and enough of a balcony to put your produce outdoors for the night. That being said, all of the rooms are small and our better view was looking out onto a small square rather than at the building across the alley or having no exterior window at all and only an indoor courtyard window. Room #202 is a good choice also. The hotel a good value and well situated as it is a few minutes walk from either the bus serving the airport that Ryan Air uses and the ferry to Tunisia. Via degli Argentieri, 4; Tel 0923.28418, Fax: 0923.437693; albergomaccotta@virgilio.it; www.albergomaccotta.it. The hotel is difficult to find. Look around the church where the Corso Vittorio Emanuele and Corso Italia almost join. Consider making reservations in advance as they were booked the night we arrived in November, as were most of the hotels, for a 2 day state exam event. We don't know if those are held more than once a year or not. Be advised that the 2 nearby grocery stores don't reopen on Wednesdays after their 2pm break for lunch. Theirs is a rentlessly unsmiling staff but they will accept bikes. We did have to put our chocolate bars under lock and key to prevent pilfering by housekeeping--out of sight wasn't sufficient once they knew we had a stash. Hotel Cairoli was as "Lonely Planet" described: a good value, well located, but dated looking with hard beds. We however liked the hard beds. Our 65€ for a double room was a discounted price for our longer stay of 5 nights; 80€ was posted as their highest price. The lack of a shower curtain always makes a disturbing mess, but the solid plumbing delivered a great shower. It was quiet enough for sleeping despite its central location a block off Garibaldi, the main drag. We locked the bikes to a staircase railing in the back of the lobby area. Only one of the 4 staff members we interacted with spoke English. The GS grocery store in the basement of an Oviesse department store a block away made our lives easier. Viale San Martino 63; Tel: 090 67 37 55. Lodging in the more isolated areas of the mountains was a near thing and Bill planned our routes based on accommodation availability. An invaluable but hard to find provincial guide was essential, the "Guida dell'Ospitalita" (Guide to Hospitality). Often these guides can only be obtained in the main city for the province, like Tràpani, Palermo, or Messina. In the case of Messina, that meant we got the guide towards the end of our visit to that province instead of when we needed it as we approached the area. Take what you can get and don't be put-off by a guide that is a year or 2 old. There are 9 provinces and presumably one needs 9 guides to cover the entire island. These provincial guides are produced by "aapit", usually written in lower case with the graphics on the "i" making it look like a mere squiggle. AAPIT, as it is occasionally written, is the Azienda Autonoma Provinciale per l'Incremento Turistico. The website for the Palermo branch is www.palermotourism.com. The layout on the guides is challenging as there are 12 lodging categories and to find all of the options for a given town, you must look at each category and then find the town listing. If you are looking for a hotel in a city, the system is easy to use. But Bill was often looking for almost any type of accommodation anywhere in a broader area, so he was sometimes looking at multiple categories in a half dozen towns to find us a place to stay for 1 night. But aggravating as it was, we couldn't have made the hinterland journey without the guide. One of our favorite resources for outside the cities came half way through our journey across Sicily, which was the www.bed-and-breakfast-sicilia.com. It is a website for the B&B's and we were told that they have no printed guide. Luckily for us, Bill had set us up with a cell phone connection to the internet for the sale of our house in 2008 so we were able to readily check for B&B's on the fly. Otherwise the B&B site would have been next to useless for us as there were few internet shops on our route and even fewer that were open when we saw them. Bill was often able to find B&B lodging for us where we needed it on our route, even off the beaten track. Most of the establishments were new, being built since 2000. We could have spent more, but Bill readily located nice places for 50-65€ for 2. In this price range, they were usually 3 stars. Some were lovely, well appointed rooms with a frig and perhaps balcony and rarely, kitchen access. B&B's quickly became our first choice if they were an option. The hosts were generally ready to give us needed tourist information though few spoke any English. About half of the hostess didn't live on-site, so you can't just show-up and expect someone to be there, as at a hotel. We generally phoned ahead the day before for reservations. Our fledging Italian was just up to the task, especially when countered with a few English words from the other end of the call. By our standards the Italian breakfasts are worthless, so just a bed without the breakfast would have suited us. Such accommodations are "affitticamere" or rooms to rent. They too can be great but there isn't a centralized resource from which to access them like there now is for the B&B's. Also, it appears that the B&B's are a new phenomena in Italy and that someone is working hard to standardize the services and culture around them, which we appreciated. An added benefit of the B&B's is their small size--sometimes only 1 or 2 rooms and rarely more than 6. In hindsight, we realized that their small size (and perhaps more 'boutique' mindset) was isolating us from the dreaded groups of Italian school children. We've sacrificed more than 1 night's sleep to the running and screaming in the halls that the hotel management and chaperones ignored well into the wee-hours of the night with school groups. The B&B's were often in quiet neighborhoods with quiet guests and we could count on undisturbed slumber. Two more sites we discovered are: www.anbba.it which does include affitacamere (rooms to rent) as well as B&B's and www.ilovebandb.com which shows its places on a very helpful map. Sicily is a destination for Italians on holiday, so it is wise to keep apprised of them so you don't get stranded by an unexpected rush. Easter is about a 10 day event that has some areas fully booked until Tuesday after Easter Sunday. Check online for the dates if you are traveling in the spring. Liberation Day, a one day holiday on April 25 booked the Aeolian Islands 10 days in advance in 2008. May 1 is another "everything is closed" holiday that, depending on how it falls on the weekly calendar, can become a long holiday interval. In addition to the holidays, grocery stores in Sicily are generally closed on Wednesday afternoons, all day Sunday, and for 2-4 hours in the afternoons. The larger stores will often not observe these closures, except for buttoning up about 1:30 on Sunday afternoons. When looking at schedules, like for the train and bus, Saturday is often considered a work day with similar service as Monday-Friday--but of course, not always. Personally, I wouldn't go anywhere near Sicily in high season--late July and August. It's smoking hot: temperature-wise, often over 100°F, and the competition is sizzling too. Lodging prices can double or triple over what we paid in the touristy areas. www.museionline.it Museums of Italy in Italian only; still useful for checking hours and days. www.festedisicilia.it Festivals of Sicily in Italian only, difficult to use. www.insicilia.it/sicilia_eventi_spettacoli.htm A travel agent; site has an English option. www.siciclando.com Cycling tour operator, perhaps no longer operating. May have free route info.